Hello. The app crashes shortly after initialization. I will provide details on request. I'll post the same instructions I found for someone else using a RX580 card for OpenCL tasks in Linux at Einstein. The Mesa drivers nor the AMD GPU or ROCm drivers install the OpenCL component necessary to run OpenCL apps. Other than pointing you at the instructions, I can provide no other help since I know nothing about ATI/AMD since I run Nvidia exclusively. Keith, I am confused by your reply. I already have OpenCL drivers, including opencl header and can run tasks from Amicable, Einstein, Primegrid and Collatz no problem. The instructions talk about installing the opencl part of amdgpu. Do yo think there is some file missing from the stuff that I have already installed? In that case, the app still should not segfault, but print error. I did try to install the amdgpu opencl part using my distribution recommended way, but it crashes all opencl becaue it requires deprecated version of libdrm. I did not try to install it directly, but I will, to see if there was a file missing. Message 67863 - Posted: 2 Nov 2018, 16:29:26 UTC - in response to Message 67862. As I stated, I know nothing about ATI. All I was suggesting is that like Microsoft with Nvidia drivers, it is common for them to ship the latest drivers without OpenCL support in the driver package. I was thinking the same thing could be happening with your ATI card. From that post at Einstein and comments in that thread, it seems that discrete OpenCL support has to be installed independently from the normal ATI driver package. Thanks. I definitely have OpenCL support installed. I tried to install the proprietary OpenCL component but ran into dependency issue. I could continue, but instead I took different path. I recompiled the milkyway separation app from source codes with debugging symbols enabled and static linking disabled. 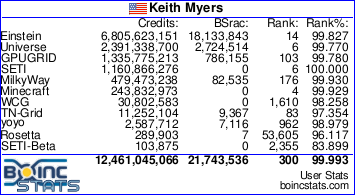 First I just plugged my custom app into boinc (via app_info.xml), but that crashed the same way! Thread 1 "milkyway_separa" received signal SIGSEGV, Segmentation fault. $6 = 0x555556178310 "-D DOUBLEPREC=1 -cl-mad-enable -cl-no-signed-zeros -cl-finite-math-only -D BACKGROUND_PROFILE=1 -D AUX_BG_PROFILE=0 -D NSTREAM=4 -D CONVOLVE=120 -D R0=12 -D SUN_R0=8.5 -D Q_INV_SQR=3.69822485207101 -D BG_A=0 -D BG_B=0 -D BG_C=0 -D BACKGROUND_WEIGHT=0.99 -D THICK_DISK_WEIGHT=0.01 -D INNERPOWER=1 -D OUTERPOWER=1 -D ALPHA_DELTA_3=3 "
I had normal stable mesa and opencl-mesa release. Thread 24 "milkyway_s:sh0" received signal SIGSEGV, Segmentation fault. Message 67867 - Posted: 2 Nov 2018, 20:07:21 UTC - in response to Message 67866. I now created/copied a simple program that would just compile, load and execute the opencl kernel with the same Flags as milkyway used. And that did not crash! Message 67868 - Posted: 3 Nov 2018, 1:18:33 UTC - in response to Message 67867. You definitely have the skill set to diagnose errors. Seems you are going to need to log the errors to MESA and AMD. Similar to what the Einstein users are having to do with Nvidia Turing cards. It is either the applications are performing a function that crashes the driver or the drivers are having issues performing a valid function that only the MW and Einstein apps are exposing. Doubtful that neither project has the developer resources to quickly effect changes to the failing applications. Solution will probably have to come from the driver developers. Message 67869 - Posted: 3 Nov 2018, 7:51:34 UTC - in response to Message 67868. On my system, Einstein apps work just fine. I do not have Turing card, however. I think I fixed it. Will submit PR once i finalize it. Message 67872 - Posted: 3 Nov 2018, 11:59:21 UTC - in response to Message 67871. The problem was that it was using different type in declaration of inline kernel source size than in definition. This resulted in size in order of terabytes, which crashed the compiler. Also I had to do these changes to build non-static debug-enabled binaries https://github.com/gridcoin-community/milkywayathome_client/pull/1. I did not submit that one to MW. Message 67873 - Posted: 3 Nov 2018, 12:35:17 UTC - in response to Message 67872. That allowed me to run Separation jobs on Polaris. NBody fails to load/compile on both Polaris and Tahiti and Separation fails to "Failed to calculate integral 0" on Tahiti. Message 67874 - Posted: 3 Nov 2018, 18:55:39 UTC - in response to Message 67873. I got it to work. At least Separation. N-Body still does not work because it is stupid. Thank you Tomas for submitting changes to the MW codebase to improve current support under Linux. We really appreciate the volunteer developers since realistically, they are the ones that have the time compared to project scientists. N-Body wasn't even supposed to work. That's why I could not get it to work. I doubt this will be useful, but I put my custom milkyway separation binary here http://www.tbrada.eu/up/363f27ebac1a27b6715609c245555881 and app info here http://www.tbrada.eu/up/6826f16895d61bf7e069dcd4acf33c21.xml. The application you provide works on my old hd7970 gpu with Mesa OpenCL libs. WU are correctly validated and execution time for single WU is around 58 seconds, so I think the is no big penalty with Mesa OpenCL libraries. Maybe Jack or Eric are interested on updating the official application. Message 67989 - Posted: 5 Jan 2019, 23:55:00 UTC - in response to Message 67925. Message 67995 - Posted: 9 Jan 2019, 14:22:58 UTC - in response to Message 67925. The code has been merged into official repository, but I do not know whether it was deployed to boinc server.